Please complete this form to submit a booking enquiry. To choose your dates please select every night you wish to stay in the property. If you have any special requirements, please enter them in the 'details' section. We will endeavour to get back to you within 24 hours to confirm your booking. It is advisable to book the ferry as soon as possible as it can be full during the summer months. Arrival day is on a Monday with a Sunday departure. This is due to the ferry timetables and the length of time it takes to clean the house from the previous week. These days can be flexible out of high season. Arrol House is a well-loved and visited luxury Scottish cottage on the Isle of Coll in the Inner Hebrides, with many of our guests returning time and time again. This self-catering holiday home, designed and furnished to the highest standard, has carefully taken into consideration the Scottish weather, making it ideal for spring, summer, autumn and winter holidays, breaks and retreats. Spacious and light, the house layout is equally suitable for couples wanting to spend time away in a luxury island setting as well as larger families, or groups wanting a retreat setting. Our accommodation has spectacular 360 views, not only of the Isle of Coll’s famous castles and two of our stunning beaches, but of the Inner and Outer Hebrides, Mull, and surrounding Scottish islands. Arrol House is on two floors and benefits from plentiful solar gain and underfloor heating throughout plus the multi fuel burning stove makes it an all year-round destination for all our guests needs. 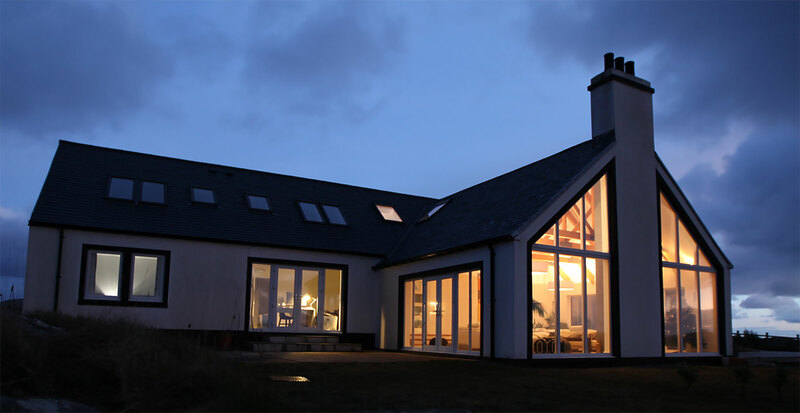 The windows on the top floor landing area and all bedrooms, make it a spectacular viewing gallery for the Hebridean islands famous dark skies and starry nights. Should you require extra sleeping accommodation for families or groups larger than 10 please contact us for further details.